What is the Better Commit Policy for Jira app? Better Commit Policy verifies the changes committed to your Version Control System against a set of configurable rules. If the changes satisfy the policy expressed by the rules, the commit is accepted, otherwise it is rejected and the user is asked to fix the change and re-commit that. It guarantees traceability from source code to user stories, tasks or other issue types, and results in high quality code, change history and controlled processes. For a high level overview of the app value proposition and core functionality, please see the app home page. This page is the starting page of the user documentation. A commit policy is essentially a named set of rules that will be verified against every commit you are trying to send into the central Version Control System repository. To add, modify or delete policies, login to Jira as administrator → open the Commits menu in Jira's header → click Commit Policies. In pre-2.0.0 app versions the navigation path is a little different: login to Jira as administrator → go to Add-ons → Commit Policies (in the left-bar). Click the Add policy button under the list to create a new policy. Each policy has a name, an optional description where you can typically explain the purpose of the policy, some options and a list of rules and conditions to verify. Commit policies are identified by unique IDs (integers starting from 1). Therefore you can rename or update a policy any time, without breaking the links between the policy and the hook scripts using it. You can also freely modify the conditions in the policy any time. All these changes will be immediately visible for the hook scripts. There is no need to re-generate and re-install the hook scripts. Commit policies can be disabled and then re-enabled with a single click on their corresponding lock icons. When a policy is disabled, the hook scripts that verify it will accept all commits without checking any conditions. Policies should be disabled primarily when you want to (temporarily) remove the constraints expressed by the policy, but you plan to re-activate those later. You should also consider temporarily disabling policies when facing technical problems in the verification process. For example, if a defect in Jira or in the app would totally stop your team's work, you can just disable the policy, let your team continue their work, fix the problem and re-enable the policy. You must be careful with deleting policies though. We suggest that you first check if there's any hook script that relies on a policy, and only delete if there isn't any. If you accidentally delete a policy that is still in use by some hook script, then those hook scripts will reject all changes until you fix problem. Fixing simply means that you need to change the policy_id variable in the hook script's configuration to make it use an existing policy. Only Jira administrators are allowed to manage (add, update or delete) commit policies. Please note that after creating a policy, the additional step of installing the hook script to the VCS repository requires different permissions. That typically requires write access on the target repository, which means administrative permissions in the VCS application or the VCS file system itself. We assume that in most of situations, Jira administrators are also VCS administrators, or at least they can efficiently work together with a VCS administrator. Git allows the same commit (i.e. a commit with the same hash) to appear on multiple branches. This leads to an interesting decision from the commit policy verification point of view. You are using a policy that requires an "In progress" issue mentioned in the commit message. You create a commit referencing a Jira issue FOO-123 (as the policy enforces) on a local feature branch B1. You push B1, the commits on this branch are verified and accepted. You move FOO-123 to the "Done" status. So far, so good. Next day, the integration engineer merges B1 to another branch B2 in the same repository. As B2 is receiving new commits, the policy is re-verified against the merged commits. Oops, FOO-123 is not in "In Progress" anymore, so the merge is rejected! You can use one of the following two strategies to resolve this. Most likely, you can just accept the commits already in the repository without being re-verified. If so, check the intuitively named option Accept the commits that already exist in the repository (on another branch) without verification. If you, in fact, need re-verification then you need to rework your policy to work correctly in both when accepting new and already-existing commits. In this case, you should adjust the conditions accordingly or use different rules on different branches. Merge commits are the commits that have more than one parent. Merge commits are typically created when merging two branches. Not being "actual" changes, Better Commit Policy bypasses merge commits without verifying them. If this is not what you want, you can turn off the Accept the merge commits without verification option. Rejection messages can be defined on two levels: for the policy and for individual rules. Those are displayed for the committer when his commit was rejected due to violating the policy or the rule. Their purpose is to explain him why his work was not accepted and to guide him how to fix it. Always explain JQL rejected commits. Instead of relying on the auto-generated message, a well-written informative message will reduce frustration and increase efficiency. For example, explain the generated message "Include exactly one issue that matches the JQL query <type = story AND sprint = currentSprint() AND status = Open>"" in plain English with "Include exactly one open user story key from the current sprint in the commit message, please.". Give an example for a correct commit message that would be accepted. A good example saves a thousands words. Add something like this to your rejection message: Use this for example: "Fix for the bug DB-123". Each commit policy contains one or more rules. To satisfy the policy, all of its rules must be satisfied, although you can limit the scope of rules to certain branches or paths only. Each rule has one of the types: tag-, branch- or commit rule. Any rule verifies the object that is suggested by its type name. Tag rules verify and guarantee the consistency and integrity of VCS tags. They contain tag conditions. Branch rules verify and guarantee the consistency and integrity of VCS branches (plus the commits on the branches). They contain branch conditions. Commit rules are the most frequently used rules. They verify and guarantee the consistency and integrity of VCS commits. They contain commit conditions. The scope of rules can be limited to specific branches and specific paths (directories and files). If a commit is not in the scope of a rule, the rule will silently by-pass (accept) the commit. Using patterns you can define the branches on which the rule is verified. For example, you can require a rule (and its conditions) only on the short-living feature branches, i.e. on the branches named feature/*. (no commit matching the pattern) The rule is not verified. (all commits matching the pattern) The rule is verified. (some commits matching, some commits not matching the pattern) The rule is verified, but only for those commits that are on the branch features/FOO-123-my-function. It is not verified for commits on other branches. Using patterns you can define the repository paths on which the rule is verified. For example, you can require a rule (and its conditions) only against the files in the images directory, i.e. against the files whose path matches the pattern images/*. (no files matching the pattern) The rule is not verified. (all files matching the pattern) The rule is verified. (some files matching, some files not matching the pattern) The rule is verified, but only for those files that match images/*. It is not verified for files outside that directory. path\\to\\some\\dir\\* ## will not work! Each rule contains a list of conditions. To satisfy a rule, either all its conditions (logical AND) or at least one of its conditions must be satisfied (logical OR). Conditions are parametric. Based on their types, they support different sets of parameters. See the next section for more details. It matches a regular expression or a glob pattern to the tag name. The condition is satisfied if the pattern matches the tag name. Require tag names in semantic version number format (ex: 4.5.11). Require tag names be one of the pre-defined "types" like release-1.2.3, snapshot-20180508, etc. Require tag names contain a CMDB item identifier (ex: cmdb-4567) that selects a "version" type asset in your CMDB. Require tag names be minimum X, maximum Y character long. The Jira issue keys are parsed from the tag name. The parser is using a configurable pattern to ignore string parts that could formally be issue keys, but are not actually issue keys. Then the JQL is executed on the latest issue information in Jira. The condition is satisfied if exactly one or at least one issue key is in the JQL query's result. The parameters of this condition are identical with those of the "Commit message must contain issue keys from a JQL query" condition. See that for more details. A "Task" type issue whose summary starts with "Release ..." issue must be associated with each tag. A "Configuration" type issue that represents a particular state of the source code must be associated with each tag. It matches a regular expression or a glob pattern to the branch name. The condition is satisfied if the pattern matches the branch name. Require branch names match one of the pre-defined "branch type" names (ex: feature/*, story/*, maintenance/*). Require branch names start with a Jira issue key, tracing the changes on that branch back to the issues that triggered them (ex: feature/CAL-123-shared-calendars). Require branch names contain a test execution ID, tracing bugfixes back to the failed test executions that triggered them (ex: bugfix/test-678). The Jira issue keys are parsed from the branch name. The parser is using a configurable pattern to ignore string parts that could formally be issue keys, but are not actually issue keys. Then the JQL is executed on the latest issue information in Jira. The condition is satisfied if exactly one or at least one issue key is in the JQL query's result. A "Story" type issue from the currently running Scrum sprint must be included in story branch names, tracing changes back to the story (or requirement) that triggered them. An unresolved "Bug" type issue must be included in bugfix branch names. A "Maintenance Task" type issue assigned to the current user must be included in maintenance branch names. It matches a regular expression or a glob pattern to the commit message text. The condition is satisfied if the pattern matches the attribute. Require at least 10 character long commit messages (excluding whitespace). Require commit messages starting with a Jira issue key, tracing changes back to the issues that triggered them. Require commit messages containing a test execution ID, tracing bugfixes back to the failed test executions that triggered them. Enforces linking (associating) commits to Jira issues that are specified by a JQL query. The Jira issue keys are parsed from the commit message. The parser is using a configurable pattern to ignore string parts that could formally be issue keys, but are not actually issue keys. Then the JQL is executed on the latest issue information in Jira. The condition is satisfied if exactly one or at least one issue key is in the JQL query's result. You can use JQL variables in the JQL parameter to make that even smarter and more dynamic. Their names are substituted with their actual values just before Jira executes the JQL search. At least one unresolved issue must be associated with every commit. Being close to the product release, only commits linked to an unresolved issue with critical or blocker priority are accepted. Exactly one unresolved issue in the current Scrum sprint must be associated with every commit. If the repository contains library code shared by multiple products, every commit must mention at least one unresolved task or bug from one of the products' Jira projects. For inspiration and more example, see the Best practices page. As an alternative, you could use the global issue key pattern setting to exclude issue keys from the verification. That setting is useful to exclude "static and globally ignorable substrings" (like test identifiers from an external Test Management system), while this option is a more local and more dynamic approach. Verifies the committed files, including modified, added, removed or otherwise touched files. It matches a regular expression or a glob pattern to the every file included in the commit. The condition is satisfied only if the pattern matches all file paths. Reject *.tmp, *.cfg, *.obj, *.class, . * and other temporary, hidden or local-only files from being checked in to the repository. Lock the "/doc/legal" directory and the "copyright.txt" file from modifications. Define a pattern that accepts *.png in the images directory, but any file outside images. This pattern is doable, but can easily become complicated. Define a rule with its scope limited to the images/* pattern, and add a condition to accept images/*.png files. This rule will not be applied outside the images directory, and this is what we want. The Jira issue keys are parsed from the paths. The parser is using a configurable pattern to ignore string parts that could formally be issue keys, but are not actually issue keys. Then the JQL is executed on the latest issue information in Jira. The condition is satisfied if exactly one or at least one issue key is in the JQL query's result. A "Bug" type issue must be included in the name of each file in the patches directory. A "Test" type issue must be the name of each sub-directory in the testresults directory. Verifies if the committer has a valid user account in Jira, and if he is a member in specific groups. The user account is looked up by the committer's username or email address, optionally. When using the username option, the VCS username must be identical with the Jira username. When using the email address option, we find the first user account registered with that email address in Jira. If there are multiple matches, a warning is written to the Jira log. Please note that albeit all VCS support usernames, emails are handled differently. Git has a dedicated user.email setting for this, Mercurial encodes it into the username setting, but Subversion does not support this at all. You can list multiple groups and require the member to be member in at least of those. If you specify no groups, then group membership is not verified. Accept commits only from (valid and active) Jira users. Accept commits only from Jira users in the android-developers or iphone-developers groups. Verifies the identity of the committer. It matches a regular expression or a glob pattern to the username or email address of the committer. The condition is satisfied if the pattern matches the attribute. It is important to understand that the committer does not necessarily required to have a Jira account! When you are using this condition together with the "committer must have a valid Jira account" condition, you can verify if committer is using the company email address or you can allow committing only for specific users. When you are using this condition alone, you can still implement verifications based on the VCS(!) user accounts. Accept commits only from users listed by their usernames. Temporarily or permanently freeze the repository by not accepting changes from anyone. If you have special requirements that cannot be solved with the built-in conditions, we allow writing custom conditions in the Groovy language. This condition executes a Groovy script, with the "context" (Groovy binding) containing the list of commits, the policy details, and other contextual information. The script has full access to Jira internals and to data managed by other apps (like Jira Agile or Zephyr). It can also call an external API and integrate with other resources that provide data for the policy verification. This condition is not included in the app yet. Please vote for the feature request if you want us to made this production ready. Hook scripts are little programs that are automatically executed by the Version Control System when a developer commits a change. In the context of Better Commit Policy, they represent the connection between the Version Control System and Jira. They are written in Python, an easy to use programming language that is readily available in most server environments. Hook terminology: Git calls them hooks, Subversion calls them hooks, Perforce calls them triggers, but they are essentially the same. Event terminology: Git calls it pre-receive, Subversion calls it pre-commit, Perforce calls it change-submit, but this is essentially the same event. It is fired before a change is to be sent to the central repository. The hook scripts used by Better Commit Policy are designed to completely hide the VCS differences from the commit policy verifier engine. The purpose is to allow using any policy containing any condition with any Version Control System. Technically speaking, there is a different script for each supported VCS, and it is the responsibility of the script to normalize the data to the common format expected by the verifier engine. The evaluation is done in the server-side and it is 100% VCS-agnostic. When started, the script collects information about the commit to be made. Then the script sends an authenticated HTTP request to Jira by posting the previously collected information to a REST end-point. The app evaluates the conditions on the passed the commit information. As result, it will return an HTTP status code and an optional text message to the script. The status code is one of accepted, rejected or execution error. The message is to explain the result for the user, typically why his work was rejected. Communicating with Jira requires hook scripts to login to Jira. Scripts will use the user account encoded in the secure token in the hook script configuration. It defaults to the user who generates the hook script. It has one very important consequence: all Jira operations made while evaluating a policy is done on behalf of the user defined in the hook script's configuration. For example, when you specify a JQL query for the JQL condition, the query will be executed by that given user. If he has no access to a project, for example, then the query will not return issues from that project, and you cannot include issue keys from that project in the commit message. Consequently, you should use a user account that has at least view access to the projects that may be referenced in commit messages. The user account should also have the permission to view other users if you want to use conditions that verify the committer. Python: both Python 2.7+ and 3.3+ lines are supported. You can install Python from this page for all major operating systems (Linux, Windows, Mac OS X). Note: most Linux distributions have Python pre-installed, you can verify them by executing the python and python3 commands. pip: (only needed in pre-2.0.0 app versions!) Python package manager, only used to install the Requests library (see next item). The actual installation steps are simple, but depend on your operating system. The app will guide you after you selected your OS. Requests module: (only needed in pre-2.0.0 app versions!) the hook scripts use this HTTP library to help with the HTTP protocol. As written previously, the hook script itself and its installation procedure heavily depends on the Version Control System used, and partly on the Operating System used. The app guides you through the hook script installation process with step-by-step instructions, to make it fast and easy. You can start the Hook Script Wizard from the Commit Policies page by clicking the Apply to a repository link at a policy. Select your environment settings in the first page of the wizard, then precisely follow the steps shown. Please note that any user, not only Jira administrators, can generate hook scripts for his local clone if he is using a distributed VCS and wants to take advantage of local verifications. A hook script consists of multiple files, that depend on your VCS system and your operating system. The Hook Script Wizard pre-configures the files you will need and creates the hook package (a ZIP file) for you from those. jcp_config.py: configuration for the hook script. See this section for details. pre-receive, pre-commit: the main logic of the script with the filename prescribed by the VCS. It should never be modified, unless you know what you are doing. jcp_common.py: a library of common routines for hook scripts. It should not be modified normally. commit_policy_id Identifier of the commit policy to verify against in this hook script. ID of the commit policy selected in the Hook Script Generator. jira_base_url Base URL of the Jira instance that will verify the policies. URL of the Jira that was used to generate the hook script. It is unlikely you ever need to modify this. jcp_token Security token to login to Jira using token-based authentication. This value is generated automatically. Do not ever change this, unless you know what you are doing! Leave this empty and set jira_login and jira_password instead for password-based authentication. jira_login User name to login to Jira using password-based authentication. User name of the user who generated the script. As he is always a Jira system administrator, the hook script will have access to all Jira data for verification. This is ignored when jcp_token is set, i.e. when using token-based authentication. jira_password Password to login to Jira using password-based authentication. Password entered when the script was generated. It must, obviously, match the previous variable. python_path (only for Subversion) Path of the python executable. You may change this value if your system cannot access the Python interpreter as it is the case with e.g. some VisualSVN environments. Providing the absolute path to Python is a good practice if you encounter any errors. svnlook_path (only for Subversion) Path of the svnlook application. It is simply "svnlook", assuming that the Subversion directory is included in your PATH environment variable. Running the hook script in diagnostic mode checks if svnlook can be properly started. If it cannot, then add the Subversion directory to the PATH (or use an absolute path for this variable) and retry. windows_default_encoding (only for Subversion on Windows) Character encoding used by Windows commandline programs for text data. (This variable affects how the hook scripts execute the commandline clients of your Version Control System.) None (forces the hook script to auto-detect the encoding from the Windows system settings). If you are loosing special characters in filenames or commit messages (ex: "ö" is transformed to "o", or Asian characters are transformed to garbage), then follow this guide to fix it. ssl_verify Verify SSL certificate when accessing JIRA. True, so the SSL certificate will always be verified. Setting this to False imposes a security risk and is therefore not recommended in production. Hook scripts need to authenticate to the Jira server before any commit verification can take place. The token encodes the user's key who generated the token, the token submission date (to support token expiration), and a strong SHA-256 cryptographic hash to ensure integrity. In addition to these, each Jira instance has a so-called token secret that is used to generate and verify the token. As this mode does not store Jira passwords in any way, this is very secure. The token also depends on your Better Commit Policy instance, so that cannot be used by a malicious user to access any other REST end-points of Jira. When to use this? Always use this mode unless you have a really strong argument not to. This mode uses the Jira username and password to log into Jira. As those are written as plain text to the hook configuration file, this method is less secure. Protect the hook configuration files in the file system. Ex: make them readable only for administrators. Use HTTPS connections from the hook script to Jira, so that the password is transmitted in an encrypted form over the network. Generate and download your hook script pack. Modify jcp_config.py: set the value of jcp_token to an empty string, and set the values of jira_login and jira_password. Run a diagnostic test to make sure that the login is accepted. Even if you followed the installation steps precisely, there may errors occur when executing the hook scripts. Errors may also occur later on the go, caused by an invalid Jira password or a temporary network problem, for example. To detect these type of problems, hook scripts can be executed in the so-called diagnostic mode. Diagnostic mode will both validate the script's configuration, to make sure that everything is configured correctly, and send a test request to Jira, to test the network communication. Not only it will show you the cause of the problem, it will also give hints how to resolve those. For instance, if the Jira REST end-point is not accessible for the script, it will ask you to check the Jira URL in your web browser. Overall, diagnostic mode is an easy-to-use and super-useful tool when resolving problems around hook scripts. Time to time, new Better Commit Policy versions introduce changes to the hook scripts in order to offer new functionality. It has two consequences. First, all hook scripts generated with the new app version will be up-to-date and offer the most current function set. That's great. Second, this also means that existing hook scripts (which are already installed to repositories) need to be upgraded to take advantage of the improvements. Upgrading hook scripts can be tedious, therefore we try to minimize its frequency, but sometimes this cannot be avoided, otherwise the app wouldn't be able to introduce new functionality. For example, if the old version does not collect enough information for proper verification of newly introduced objects (branches, tags, etc. ), then there is really no other option than upgrading. Hook scripts know their own version. At every verification, the hook script sends its version to the server. The app on the server checks if there is a newer version available for that particular VCS type. This makes the problem visible for the Jira admins. This makes the problem visible for the committer. Overall, this is easy to see which repositories are still using outdated hook scripts. To upgrade an outdated hook script, all you have to do is simply re-installing the hook script to the repository. The affected repository is identified in the message. The re-installation will install the most current hook script version, which is compatible with your app version and your VCS, to the repository. It will simply overwrite the outdated version existing there. Server-side hook scripts (in the central repository): an admin with access to the server-side file system (which hosts the repository) should re-install the hook script. Client-side hook script (in the local clone): the developer should re-install the hook script to his local repository. There is really no need for the admin to be involved in this case. In any case, after you successfully upgraded, the "outdated hook script version" message will not be shown any longer. If you are using Bitbucket to manage your Git repositories, then the Bitbucket app called Better Commit Policy for Bitbucket is used (instead of actual hook scripts) to interact with Better Commit Policy for Jira. In that case, the Bitbucket app itself is the "hook script". Similarly to hook scripts, the Bitbucket app may also become outdated. To upgrade that, simply upgrade the version of ommit Policy Plugin for Bitbucket. The compatibility rule is simple: use the greatest hook script version that is less or equal than your app version. For example, if you are using app version 3.0.0, then you should use Git server hook script 3.0.0 or Mercurial hook script 2.0.0. Certain configuration settings are global to the app, i.e. they universally apply to every policy. This regular expression (regex) is used to recognize Jira issue keys in commit messages. The default setting matches every text piece that is formatted like (and thus potentially could be) a Jira issue key, like FOOBAR-123. Only change this pattern if in the commit messages you want to mention strings that are formally identical with Jira issue keys, but that are not actually Jira issue keys. For instance, you may want to mention a reference to an item in your Requirements Management or Test Management system, like REQ-123 or UITEST-456, that you don't want to be falsely recognized as issue keys. The second pattern should give you an idea how to implement this for any number of prefixes. JIRA consistently uses all-uppercase project and issue keys everywhere (ex: FOO-123). That is the default for Better Commit Policy, too. Starting from Jira 7, project keys can contain numbers (ex: FOO16). If you have installed Better Commit Policy version 2.0.0+, then the default issue key pattern also supports this, recognizing issue keys like FOO16-123. In contrary, if you upgraded to 2.0.0+ from a previous app version, then the default issue key pattern will not support numbers. To fix this, just go to Global Settings, clear the issue key pattern and save your settings. The issue key pattern will be reset to the new default. This regular expression (regex) is used to recognize Jira issue keys in branch names, tag names and the paths of modified files. You may want to use a pattern that is different from commit messages, because you may prefer different white space characters or uppercase/lowercase rules here. See issue key pattern in commit messages section above for more details. This regular expression (regex) is used to recognize branch names in Subversion paths. See the Subversion-specific verifying branches and tags section for more details. This regular expression (regex) is used to recognize tag names in Subversion paths. Each changeset that contains at least one commit with a message matching this regular expression will be accepted, without checking the conditions at all. In the default case, every changeset with a commit message containing the text #jcp_bypass will bypass the checks. Important: this pattern should not be misused by adding it every time when it feels "inconvenient" to correctly form the commit message. It should only be used as a workaround in situations when the policy must be violated for a good reason. A best practice is to keep this in secret, so that regular developers do not know it. Ideally, only a restricted group of senior developers, team leaders or integration engineers should know it. Pro-tip: as bypass is a regexp, it is possible to define multiple "sub-categories" for bypassing, like #jcp_bypass_3rdparty or #jcp_bypass_legacy. This value, frequently called salt in cryptography, is used to generate and verify tokens. You must keep this setting secure, because this is what makes token-based authentication cryptographically secure and reliable. When you first install Better Commit Policy (or you upgrade from a pre-2.0.0 version to a newer one), this secret is initialized to a random value. Please note that changing the token secret will invalidate all tokens that were generated using the old value of the secret! That means that you only need to alter it, if it became known for some external party due to a data breach, and if you are ready to re-generate and re-install all your existing hook scripts. A token is only considered valid if its age does not exceed the expiration period, expressed in days. Technically speaking, each token encodes its creation date and we check whether (creation_date + expiration_period) > now. The default value is 999999999, effectively disabling token expiration. or to force your developers to periodically re-generate their hook scripts for maintenance or security reasons. For instance, you can enforce them to upgrade their local hook scripts in every 365 days to get the latest version. You can restrict which Jira groups the main Commits menu in the top navigation bar should be displayed for. You can reduce the clutter by hiding it for anyone, but your administrators and developers, who will actually use it. Leave this setting empty to display it for every authenticated user (this is the default setting). Note: anonymous users will never see this menu. Many of the app settings rely on using so-called patterns that are matched against pieces of text, like commit messages or branch names. There are two kinds of pattern syntaxes supported, each with its own merits. Please note that regex has multiple, slightly different dialects. Better Commit Policy uses the Java-style regex dialect. To test if your regex works exactly as expected, RegexPlanet (for Java) is a safe choice. Globs offer a simpler syntax relying on wildcards. Globs may be significantly easier to use than regex in many use cases, but the cost of simplicity is that their flexibility is limited. See the Wikipedia article on glob for start. Then read through one of the many glob tutorials on the web. Although many of those articles are talking about globs in the context of the Unix operating system, those are equally applicable to the Better Commit Policy glob expressions, too. There are two main paradigms in Version Control at the moment: centralized (like Subversion) and distributed (like Git). Providing a full comparison between those rather different ideas is not in the scope of this manual. Please refer to the distributed revision control article in Wikipedia instead. This section focuses on their differences from the Better Commit Policy's point of view. In case of a centralized version control system, users commit a single change at a time. That commit can be verified, accepted or rejected immediately. When rejected, the developer can fix the problem and commit again. There is no delay, everything happens "immediately". Distributed version control systems (DVCS), however, work in a different way. They allow working offline, making any number of commits in the developer's local repository ("local clone") without communicating with the central repository. Then, when the time comes, developers can "push" all those changes in one go to the central repository. A single push can include any number of commits, even on multiple branches, any number of tags, and so on. Blessed repository: as it stores the "official version" of the code, verifying commit policies in blessed repositories is an absolute must. Learn more about installing server-side commit hooks. Server-side clone: it stores the "working copy" for the developer on the server (there is one of this per developer). As the blessed repository is involved relatively late in the process, verifying commit policies in server-side clones finds wrong commits earlier, making it easier to fix those. Learn more about installing server-side commit hooks. Local clone: it stores the code on the developer's own work station (locally). This is where the actual development work is getting done. Verying commit policies in local clones is the earliest point in the process to find wrong commits. It will simply super-charge your developers, save frustration and unnecessary efforts with fixing wrong commits. Learn more about installing local commit hooks. 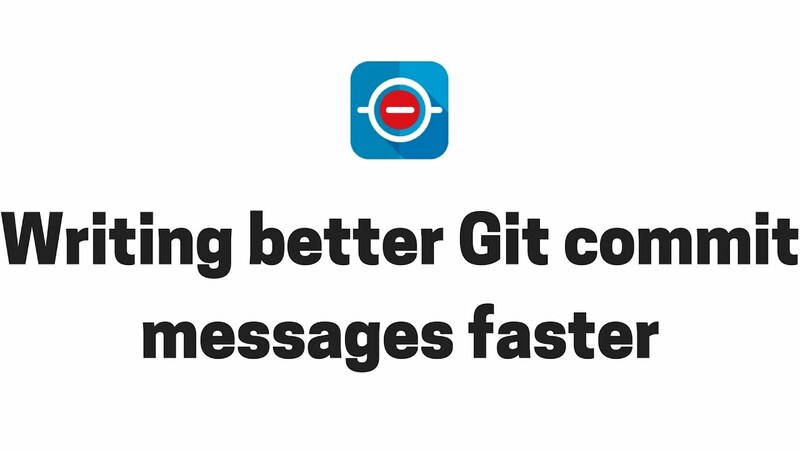 How to write better Git commit messages faster? When verifying, either the whole set of changes is accepted or the whole is rejected. There are no "partially accepted" change sets. The conditions of the policy are evaluated on each commit separately, and then the change set is accepted only if every commit in it satisfies those. In other words, the whole change set is rejected and must be fixed if there is only one commit in it that violates the commit policy. This page summarized the general, VCS-independent concepts that apply to any Version Control System supported by the app. Learn more about the VCS-dependent features in the Git, Subversion, Mercurial, Perforce, Team Foundation Server, and ClearCase pages.